Keneally-Bendian-Lunn rip into “Skies of LA” at Orion Sound Studios in Baltimore MD on May 22, 2014. Video by Guest Host J.D. Mack, audio by Mike Potter– thanks, you guys! Hi, it’s Mike – having a great time with Keneally-Bendian-Lunn on the road, a rocking little trio if I do say so myself. We had a real blast last night playing the NJ Proghouse in Dunellen, NJ, maybe our best playing of the tour so far. So we are feeling good and warmed up for the last four shows of the tour. Tonight is The Middle East in Cambridge, MA, with School For Robots and Bent Knee opening. Tomorrow night is the Bearsville Theatre in Woodstock, NY, with our good friend Jesse Gress sitting in with us for a few classic tunes by Mahavishnu, Jeff Beck and Todd Rundgren, and Paul Green’s Rock Academy kids opening. (Part of our Bearsville soundcheck will be broadcast live on WDST-FM starting around 5pm EST.) We’re winding up with gigs in Charleston, WV and Scottsville, KY (this one’s free!). A whirlwind of shows in two weeks, it’s going by like a flash but I’m having a tremendous amount of fun and the audiences have been really into it. I hope to see a bunch of you at the final four shows. After this is over, I get to be home for about eighteen hours and then it’s right back on the road with Satriani for three East Coast gigs and then festivals in Europe until late July. Looking forward to getting back on the road with Joe, Bryan and Marco and seeing a bunch of you folks. There’s a JamPlay video of me demonstrating the intro to “Dee ‘n’ A” which I’ve just seen for the first time – will be very helpful for me if I ever forget how to play it – you can check it out here. We’re going to be making an interesting collection of demos from the turn of the century available via download very soon – more news about that coming shortly! 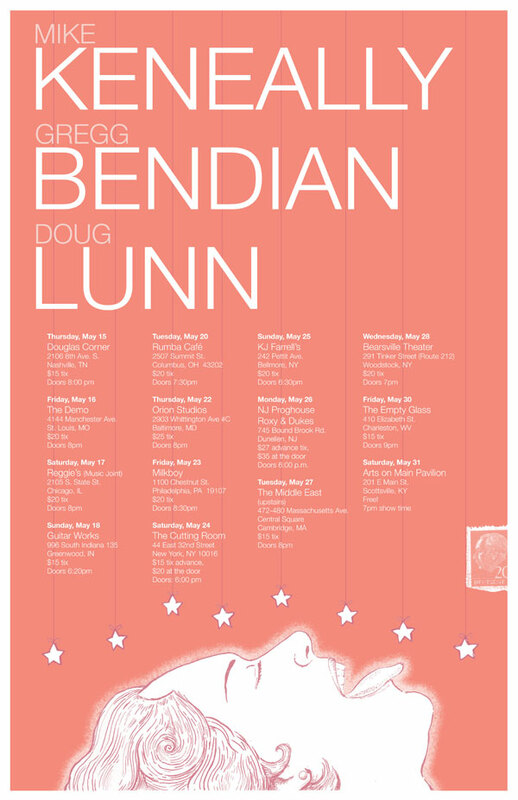 Previous Post:Keneally-Bendian-Lunn Live at Orion! Next Post:Mike on tour with Joe Satriani!